Want to add value to your home while making it beautiful? 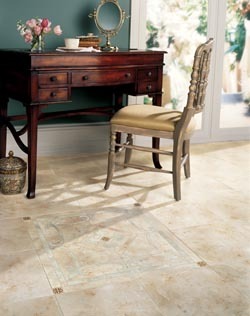 Come to our local retailer for a wide array of durable tile flooring options to improve the look and worth of your home. No matter what your personal style is, our wide selection of porcelain tile, ceramic tile and slate tile flooring offers something to suit any décor. From classic looks that stand the test of time to eye-catching options to make a big statement, we have it all. Come by our showroom to see just how extensive our selection is. Our expert flooring associates will gladly show you around to find the right tile flooring for your home. We also provide expert tile flooring installation from our technicians after you find the ideal flooring that works best with your lifestyle and budget. Trust us to give you the best tile flooring available from reliable brands such as Design Distinctions and Floorcraft. Whether you prefer ceramic, porcelain, or slate tile flooring, we have just what you need. Visit our showroom to peruse our outstanding selections of porcelain tile. We receive stock from a variety of high-quality sources to give you porcelain tile flooring you want at the prices you need. Because of our buying power, we’re able to get deals on our flooring and pass the savings onto you. Come by today and meet with an associate. Not only are our prices affordable every day, we also have specials so you can upgrade any room with the flooring that best suits your needs in looks, performance, and price. Selecting a quality tile is only a step forward to transforming your kitchen, living room, or other space. Luckily for our clients, we have a superb collection of unique and stunning slate tile flooring. Slate is known as stunning natural stone that is generally more affordable than some other high-end materials. It is strong and stands up well—both indoors and out—to heavy foot traffic. It is also ideal for bathrooms, kitchens, mudrooms, and basements, due to its high level of water resistance. You can trust our experts to lay the tile perfectly, as they’re familiar with the brands we sell and have been trained according to our own standards of quality. We want every customer to enjoy attractive, long-lasting tile flooring—that’s why we make sure you understand every aspect of your selected option and the tile flooring installation process. You can also put any fears you have to rest about investing in tile flooring thanks to our industry-leading warranties. From fading to stains, we guarantee your tile will resist external factors and can last up to 25 years. Even unique tiles in special shapes, sizes, colors, and textures come with our warranties to ensure your peace of mind. Contact us to learn more about our tile floors. We proudly serve customers throughout Gonzales, LA, and the surrounding areas.